When y'all vote, could you bold the actual vote like "No to review <Unit Name>" or "Yes to induct <Unit Name>"? I think that would make it easier for the person tallying the votes, and also there are some times when you only have a few minutes and may just want to know what someone voted not why. Just my Ignore it if you want. Thanks, very fair request & I'll do it. Unless I forget. When the names have baggage, HeroScape has historically captured that baggage in the theme. "Asmodeus" is a name with a ton of baggage, though apparently Krysto didn't know it at the time. It has baggage both from the world of fiction - AD&D Lord of the Nine Hells - and from the world of mythology, it being the name of the King of Demons. Put that name on a card and, in the tradition of HeroScape, those things should be captured thematically. Now hold on there, you're assuming I didn't know who Asmodeus (the other, less interesting one) is? I know very well what you are talking about, I've played enough and read enough to know that too, along with Beelzebub (Baelzebub), Demogrogon, Yeenoghu, Geryon, and pretty much anything in that subcategory. I'm not going to apologize for being stubborn about a small thing. I'm not going to green light a unit that does not fit, thematically, perfectly into the 'Scape canon. And if that is true, you've just stated that you disagree with the entire THEME of 'scape. We, and I mean we enjoy Heroscape because of its diversity and its thematic ability to incorporate literally anything from any realm. Why would anyone make such a blatant contradiction is beyond me. I mean, come on, we already have orcs on dinosaurs and mutant aliens. We have copyrighted SuperHeroes and we have historical figures, both fictional and non. There's anthro characters and there's D&D. What is so bad about a book? Not to mention an award winning book. Still if the wording is what bothers you, that can be fixed, though as far as I can see it is still pretty clear. For now, if this is the case I just don't think I'll bother anymore, it really cannot possibly be worth it. I think I'll let my customs succeed on their own merit. No I'm not mad because you rejected my custom, I'm just mad because you're letting something so petty bias your opinions. Instead of arguing that we should use a property/concept that has rights owned by someone why not simply change the name and the concept a bit to match? That way it can potentially be given a YES in the future. Daddyscaper wasn't the only one who doesn't want to okay a card because of those reasons. Go back to the drawing board and fix it. Krysto, if you knew the history of the name, how can you possibly be surprised that I care about its relationship to the unit? You know as well as I do that I support you and the customs community you are a part of. But in the role I have here it is my business to let *everything*, including things that are "petty," inform my decisions. I'd also say that DS, you need to get over the idea that a certain name could be used. We all know Asmodeus is one of the 7 demon princes of Hell, the demon lord of lust. Still in this respect it is just a name. dok sums up the way I feel about it pretty well. My vote isn't necessary at this point, but I would have vote no as well based on the theme. I agree that part of what makes something fit into the Heroscape theme is a generic nature. Just to apply this idea to another set of figures - I've looked at a lot of star wars minis lately. Many of them could make very nice HS minis in theory, but when I look at a storm trooper, it's a storm trooper, and no amount of backstory is going change that. Some other figures aren't obviously from Star Wars (at least to me), so they seem like better candidates for conversion. I don't feel the same way about historical figures, or about classic mythological figures. And of course, there's a place for conversions of entire canons - we have entire LotR and Star Wars minis projects, after all, and of course the Marvel/C3G figures work from an existing backstory. But that's not what Valhalla-scape is about, in my opinion. To me, a name being a direct reference to another work of fiction isn't a point in that figure's favor - it's a strike against it. you need to get over the idea that a certain name could be used. Okay then don't but when I submit my Mexican cowboy gunslinger named Jesus Muerte and you shoot it down don't expect any respect from me. Jesús Muerte would be an awesome name for a mexican cowboy gunslinger, just remember that in spanish there is an accent mark for that name. Jesús. [xe'sus]. I would like to submit dok's Zombie hulk. I really think it has potential and the Zombie Hulk is 2.79 on Auggies. Thanks for the nomination, Tiranx! Before I go any further... this custom is at most half mine. The original idea belongs to Good Pig, and a quick read of his original version reveals that I haven't changed the card that much. I switched from the SotM card style to the wave 8+ style, and I figured out how to tweak the text area so that I get a slightly larger font. 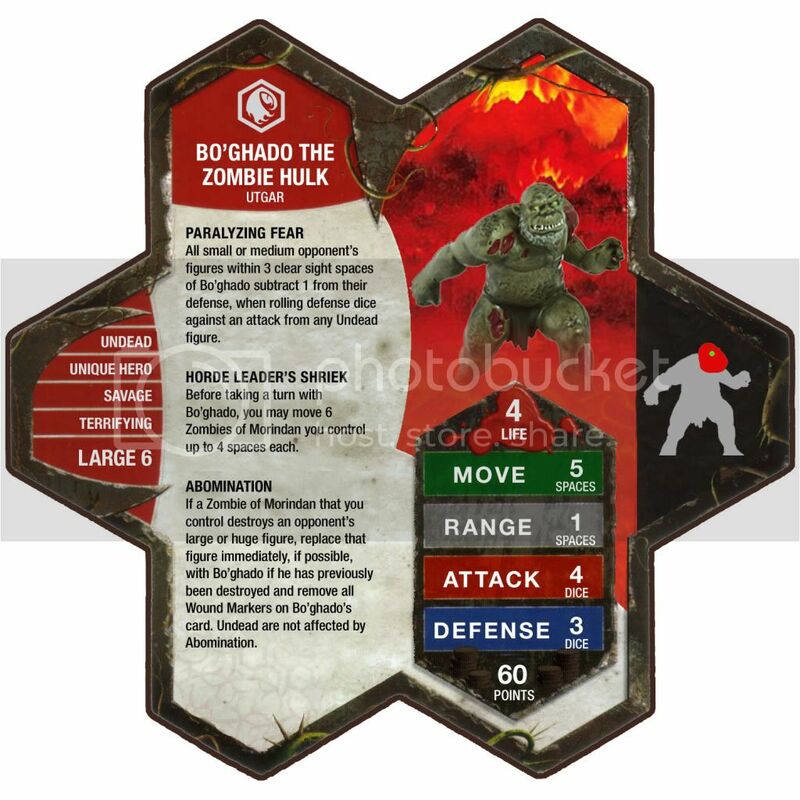 In Zombie Shriek, "... take a turn with an Undead..." is changed to "... take a turn with another Undead...", so it's clear that you can't take two turns with the same Zombie Hulk. The phrasing of paralyzing fear is reworded to more closely match similar powers like mob attack and homing device. Finally, I should note that the intention is for this figure to be mounted on a deathwalker-style single-hex base. I will verify that this is feasible when my three Hulks arrive in the mail... along with by D3 shipment, either tomorrow or Monday. I will also verify the true Heroscape height of the figure at that time, so stay tuned for a revision to the "large 6" designation. Last edited by dok; November 20th, 2010 at 11:39 AM.